Katie McGarry delivers again with Chasing Impossible. 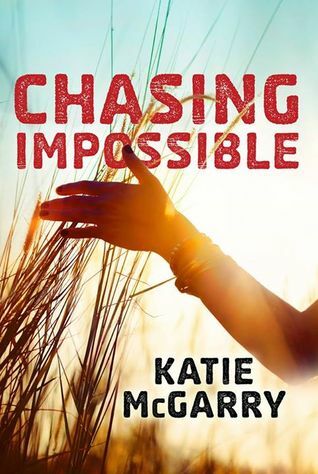 As a devoted lover of the Dare You To series, I had to read Chasing Impossible. Abby, the elusive beautiful and intimidating "drug dealer" finally has her own story, one with all her secrets on the table. I admit, I had a problem placing Logan when I started the book. That name has become so common place in my books I couldn't remember how the Logan from this series acted. But I quickly caught up, watching Abby and Logan chase a dream that seemed impossible from the start but the two never gave up, on themselves or each other until they found a way to make it work. From the start Logan was an emotional guy. Admitedly he held those emotions inside, masking them with defying stunts. He'd accepted his fate as a diabetic, as long as it stayed a secret. But he didn't want to accept that it was apart of his life, made his life choices different, it made him different. It wasn't until getting to know Abby, understanding her fears of revealing a difficult truth that he came to view his own secret in a different light. Logan, while being labeled the group daredevil, was surprisingly grounded. Something he learned from his father whom he respected a great deal and loved dearly. It was a nice change of pace, to have a well balanced father who loved and supported his son to such a degree. It was also nice to see Logan understand his eccentric mother, he could relate to her desire not to be put in a box of routine and ordinary. All the love Logan poured out to his friends, his parents, to Abby made him incredibly easy to love. Abby was complicated. Love for her friends and family made her feel like she had to be. A responsibility that was too heavy fell on her shoulders at too young an age. A reputation followed her whether she wanted it to or not, one she couldn't escape even when it put her life in danger. Overwhelmed, Abby was prepared to give up in order to protect those she loved. In order to survive Abby had to accept that everything would be different, even things she didn't want to change. Abby liked to pretend, but she pretended for too long, and the life she felt pushed into finally caught up to her and trapped her in. It was time to make the tough choices.